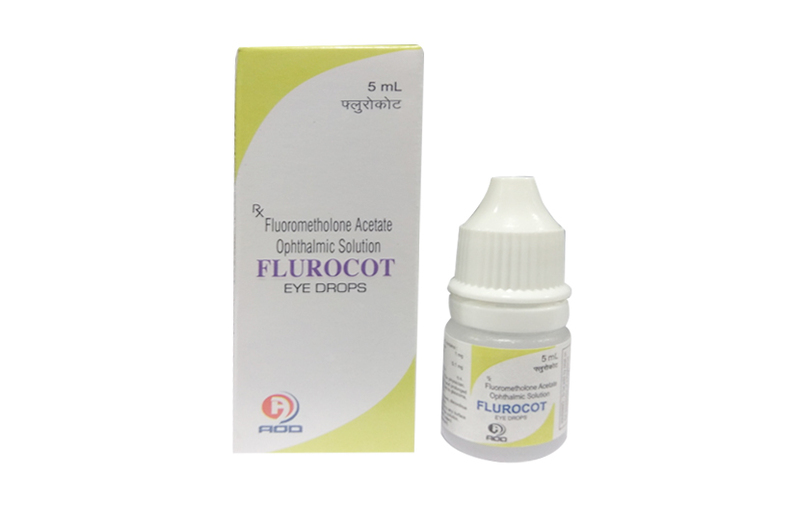 Flurocot Eye Drops is an anti inflammatory agent inhibits the edema,fibrin deposition,capillary dilation and phagocytic migration of the acute inflammatory response, as well as capillary proliferation, deposition of collagen and scar formation. Flurocot Eye Drops is indicated for use in the treatment of steroid responsive inflammatory conditions of the palpebral and bulbar conjunctiva, cornea, and anterior segment of the eye. Flurocot Eye Drops is used to treat certain eye conditions due to inflammation or injury. Fluorometholone works by relieving symptoms such as swelling, redness, and itching. It belongs to a class of drugs known as corticosteroids. Contraindicated in acute superficial herpes simplex keratitis, vaccinia, varicella, and most other viral diseases of cornea and conjunctiva; tuberculosis; fungal diseases; acute purulent untreated infections, which like other diseases caused by microorganisms, may be masked or enhanced by the presence of the steroid; and in those persons who have known hypersensitivity to any component of this preparation. Use in the treatment of herpes simplex infection requires great caution. Prolonged use may result in glaucoma, damage to the optic nerve, defect in visual acuity and visual field, cataract formation and/or may aid in the establishment of secondary ocular infections from pathogens due to suppression of host response. Acute purulent infections of the eye may be masked or exacerbated by presence of steroid medication. In those diseases causing thinning of the cornea or sclera, perforation has been known to occur with chronic use of topical steroids. It is advisable that the intraocular pressure be checked frequently. Shake Well Before Using. One to two drops instilled into the conjunctival sac(s) four times daily. During the initial 24 to 48 hours the dosage may be safely increased to two drops every two hours. If no improvement after two weeks, consult physician. Care should be taken not to discontinue therapy prematurely. Flurocot Eye Drops is supplied in 5 ml clear poly bottles packed with printed labeled in a unit carton and, Such 25 Carton packed in a shrink sleeves.such,12 shrinks packed in a shipper.